The point-to-point course is a flat and downhill run, with a net elevation loss of 1800 ft. 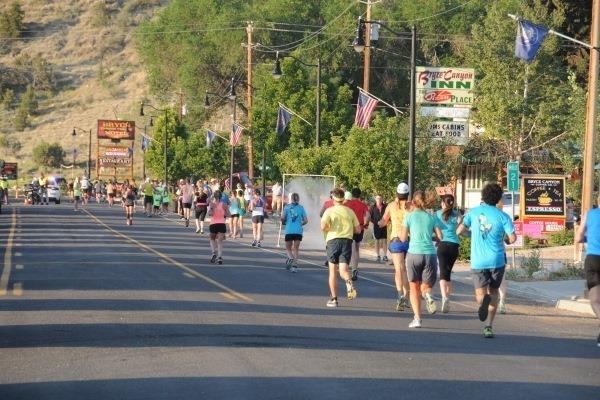 The race begins at 6:00 AM at Ruby’s Inn on Highway 63, in Bryce, Utah. 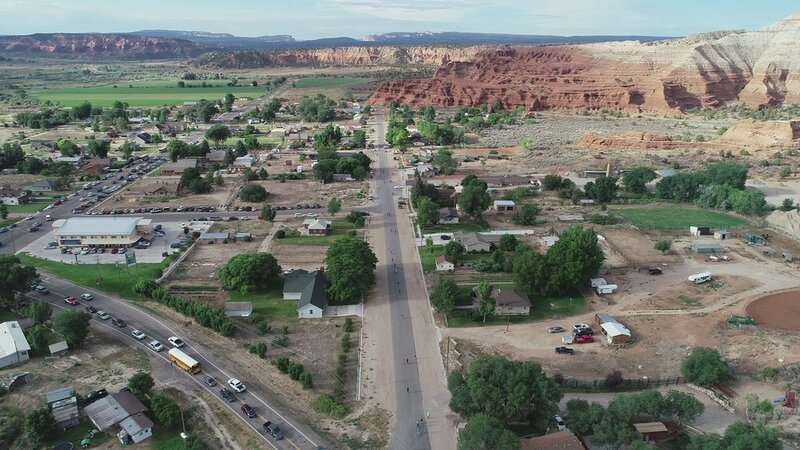 The course heads north briefly, then turns east onto National Scenic Byway 12, where runners are treated to spectacular views of the sunrise as it lights up the pink cliffs and red walls of the canyon ahead. For the next four miles, the route descends through Bryce Canyon National Park, offering beautiful vistas of the unique sandstone pinnacles and spires that rise from the bottom of the canyon. After mile five, the course leaves the park and the downhill becomes more gradual as the route rolls through pastures and ranches, crossing the Tropic Ditch and descending into the town of Tropic. From there, the course continues eastward along the Paria River and toward the finish in Cannonville, at an elevation of 5,800 feet. Brilliant red and white rock formations frame the finish line, creating a memorable end to the race. Runners must finish by 9:00 am. Shuttles will be available to pick up runners. Top 5 places will receive trophies and the following cash prizes for each overall male and female winner. Top 3 winners in each age category male and female get a place medal. Finisher's Medal awarded at the finish line in the runner’s corral at the Cannonville Town Park. 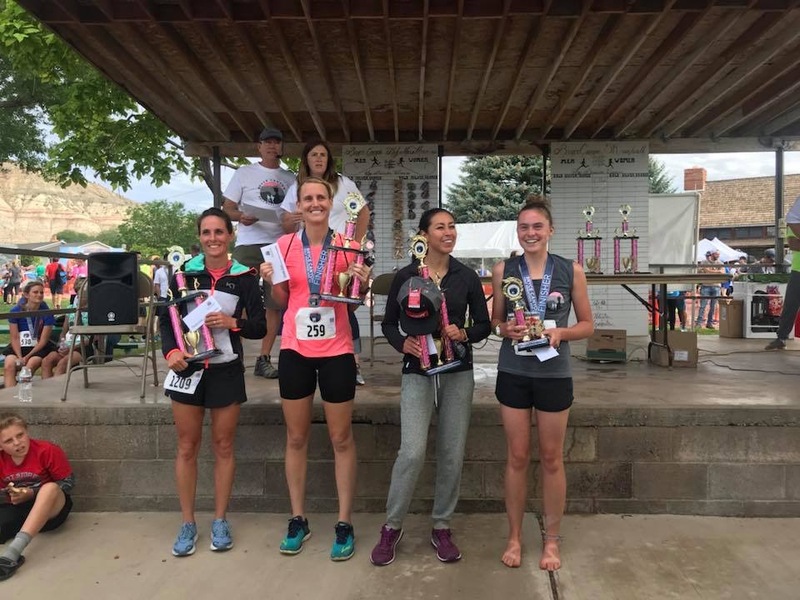 Shuttle Buses provided in Panguitch, Tropic and Escalante to and from the race. For runners only. See Shuttle Schedule information below. 8 Aid Stations are located along the Half Marathon course. Porta-Potty access at most aid stations and other spots along the raceway and at the finish line. Water and Gatorade are provided at the starting line and aid stations. Finish Line in the Runner’s corral - fruit, bagels, water, chocolate milk and ice cream available! Report emergencies at any of the aid stations or at the first aid center at the Cannonville town park. The 5K Walk or Run is for those that want to share the experience but not have to run or walk quite so far. The starting line is at the Cannonville Town Park and takes you south along Kodachrome Road. 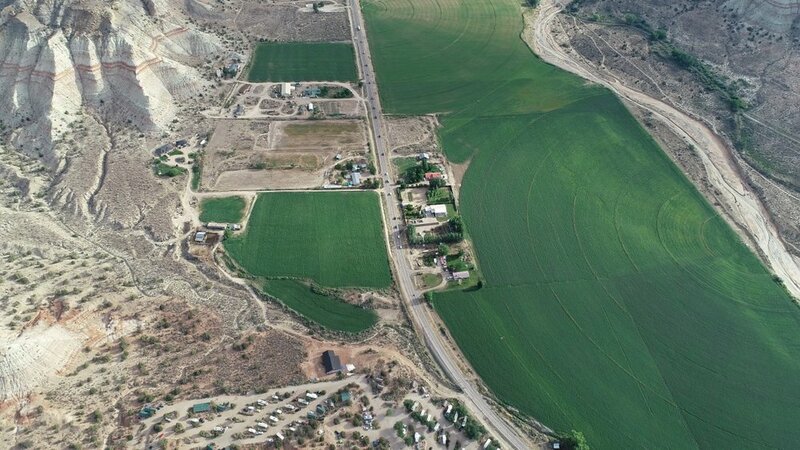 Enjoy early morning views of the beautiful red rocks and the famous Promise Rock in the valley to the east. The run/walk takes you 2.5 kilometers (1.55 miles) south to a water station and then back to the the finish line at the same town park. Top 3 in each age category male and female will receive a place medal. Bib numbers Issued Saturday morning just prior to the race. There will be one aid station for the 5K at the half-way point. Porta-Potty access will be at the town park. 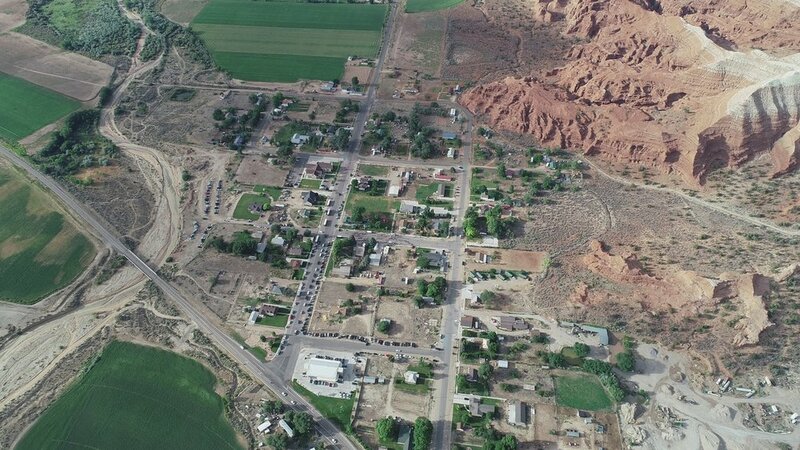 Registration and packet pickup will be at the Grand Staircase National Monument Visitors Center located at 10 Center St, Cannonville, Utah (north of the Cannonville Town Park). During the registration process, you purchased tickets instead of bib numbers. You can see your tickets by logging onto Active.com. You can edit and change your registrations until Thursday July 11, 2019. If you are not able to make it to packet pickup in person, please contact us using the contact form to notify us. Be sure to include the name of the designated packet recipient in your message. 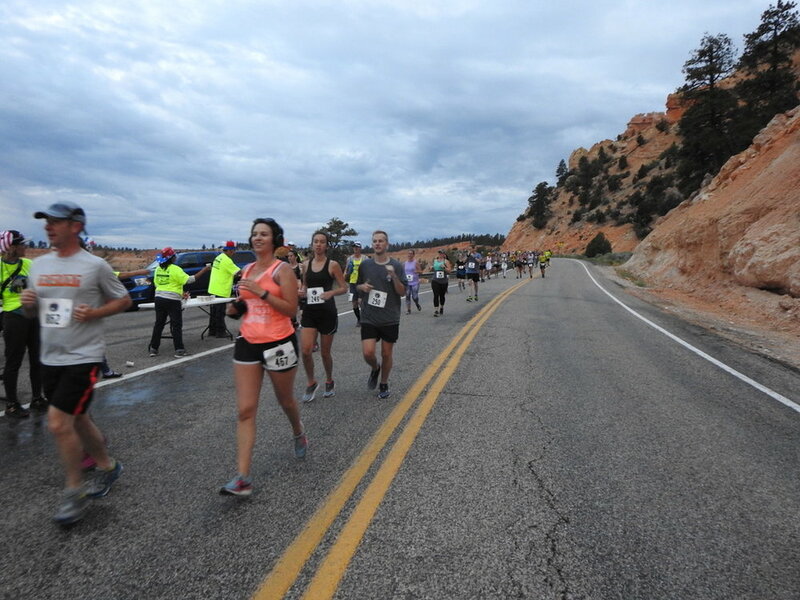 The Bryce Canyon Color Run is organized and sponsored by the Bryce Valley Foundation for the Arts, a non-profit foundation which promotes music and the arts in Garfield County. This Color Run takes place the night before the half marathon during the spaghetti dinner and packet pickup for the Half Marathon & 5K. This race is fun for the whole family. Get blasted with color and enjoy the crazy and colorful excitement as a runner or help throw the color. The race starts at the Cannonville Town Park and winds right through town itself and back to the finish line. 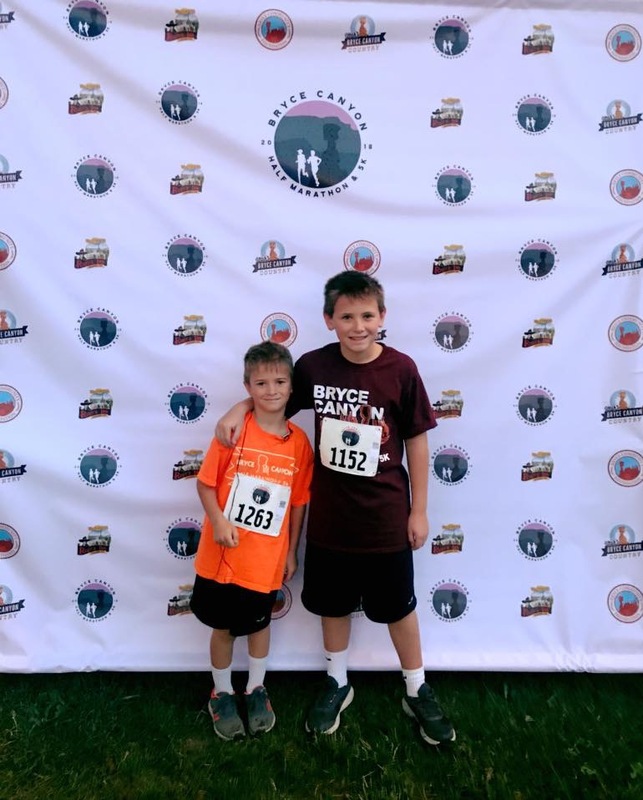 All proceeds from the Bryce Canyon Color Run will go to the Foundation, whose primary event is the Bryce Canyon Music Camp, a weeklong music workshop (violin, viola, and cello) that brings world-class clinicians to the rural Utah. 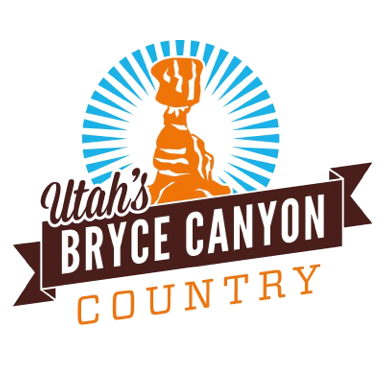 Click here to learn more about Bryce Canyon Music Camp. 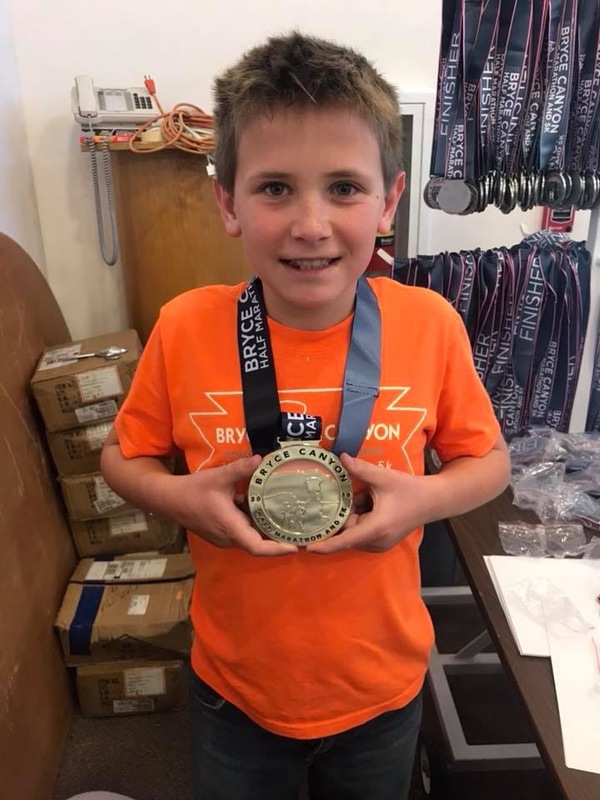 Finisher's Medal awarded at the finish line in the runner’s corral at Cannonville Park. All other awards will be given at the awards ceremony which begins at 8:30 am Saturday morning. 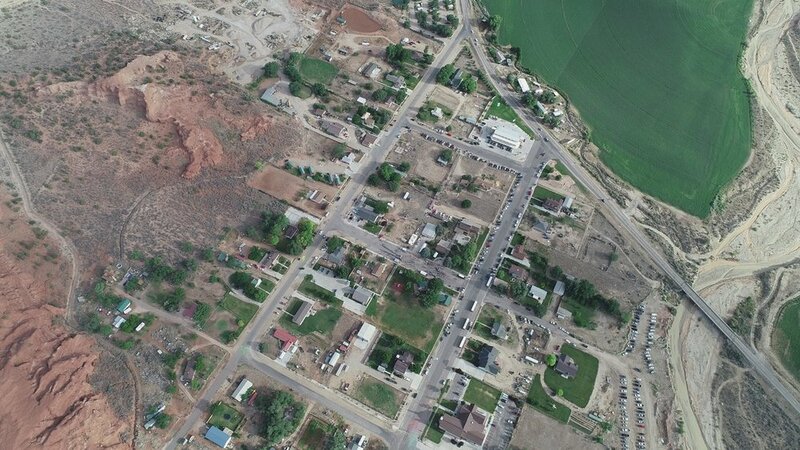 Shuttle Buses will be available in Panguitch, Tropic and Escalante. Shuttles are for runners only. 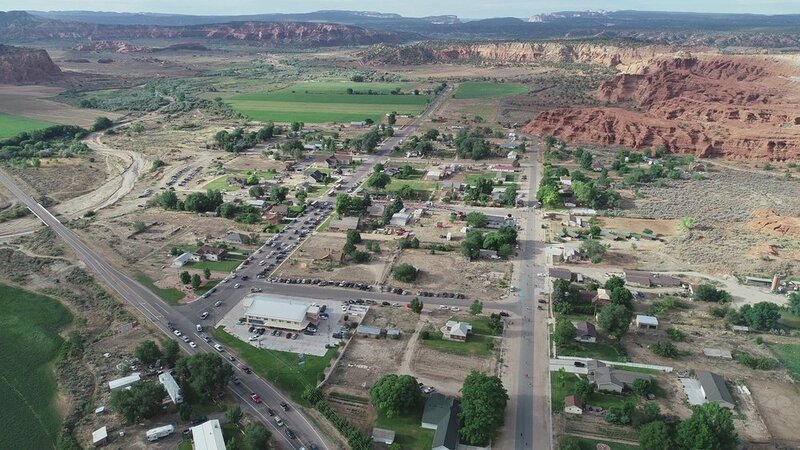 Shuttles to take runners back to Panguitch, Ruby’s Inn, Tropic, and Escalante will leave when the shuttle is full around 9:00 am. Friday night Spaghetti Dinner will be 6:00 pm at the Cannonville Town Park - $8 for Adults / $5 for Children, proceeds benefit the Mustang Booster Club. Saturday morning Pancake Breakfast will be at 7:00 am at the Cannonville Park - $5 per person, sponsored by the Bryce Lions Club. Help us recognize our wonderful volunteers! Vote for your favorite aid station at the finish line! The aid station with the most votes is eligible for a prize! How many aid stations do you have and are they the same distance from each other? We have 8 aid stations for the Half Marathon and 1 station for the 5k. Please see the Aid Station section for each race for locations and distances. Aid Station locations are marked on the course map. Can I be reimbursed for or defer my registration? Unfortunately we are not able to reimburse the registration price but we are able to defer your registration for 1 year. Please contact us using the contact form with detailed information. I would like to advertise with your race, who do I contact? Please contact us using the contact form for more information. Are shirts available to purchase? At the finish line previous years shirts are available for purchase at discounted rates. The current year runner’s shirt will be available at full price. I would like a different shirt size what do I do? On Saturday runners shirts may be exchanged for a different size, if available. Please alert staff at the T-shirt sales tent. Where are the results posted? RunSum.com and hear on our website. Where are the pictures posted? Event pictures will be posted on our Gallery page when available. Can I send someone else to pick up my packet? Yes! Please contact us using the contact form with details about the designated packet recipient. For all other questions, please contact us using the contact form. 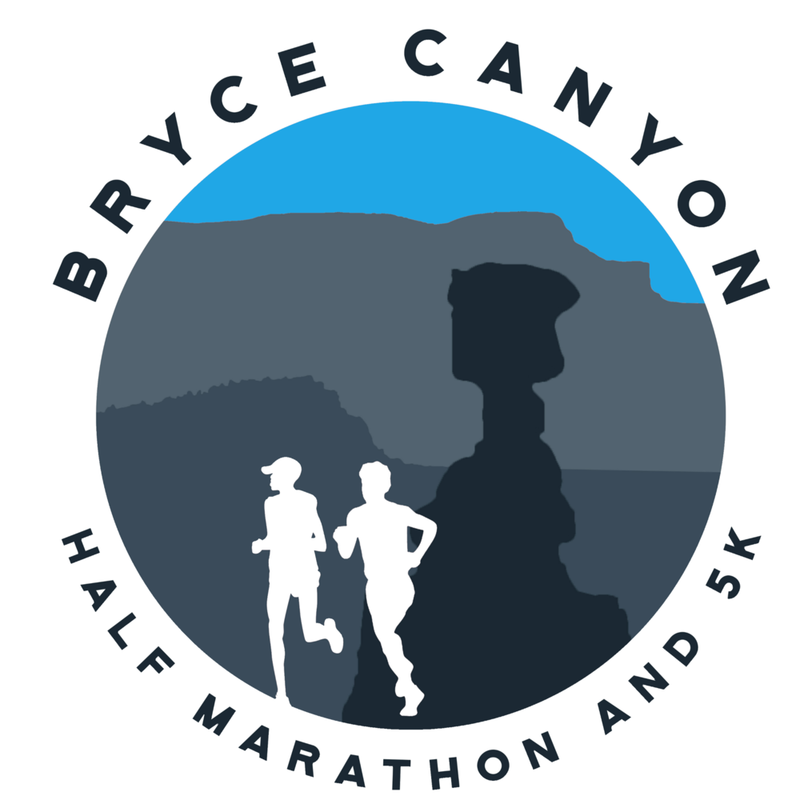 A special thanks is given to all of our Sponsors and Volunteers who are the reason we are able to make the Bryce Canyon Half Marathon happen. We are would like to recognize our sponsors and key partners.